1ug/mL was sufficient for detection of PINK1 in 20 ug of rat brain lysate by colorimetric immunoblot analysis using Goat anti-mouse IgG:HRP as the secondary antibody. Fusion protein amino acids 112-496 (cytoplasmic C-terminus) of human PINK1. 82% identical to rate and 81% identical to mouse. >30% identity with DMPK. Neuroscience, Cell Signaling, Post-translational Modifications, Phosphorylation, Cadiovascular system, Heart. -20 degree C; 1yr+ Avoid freeze/thaw cycle. Small volumes of anti-PINK1 antibody vial(s) may occasionally become entrapped in the seal of the product vial during shipment and storage. If necessary, briefly centrifuge the vial on a tabletop centrifuge to dislodge any liquid in the container`s cap. Certain products may require to ship with dry ice and additional dry ice fee may apply. Scientific Background: PINK1 (PTEN induced putative kinase 1) is a mitochondrial serine/threonine kinase which maintains mitochondrial function/integrity, provides protection against mitochondrial dysfunction during cellular stress, potentially by phosphorylating mitochondrial proteins, and is involved in the clearance of damaged mitochondria via selective autophagy (mitophagy). PINK1 is synthesized as a 63 kD protein which undergoes proteolyt processing to generate at least two cleaved forms (55 kD and 42 kD). PINK1 and its substrates have been found in the cytosol as well as in different sub-mitochondrial compartments, and according to the recent reports; PINK1 may be targeted to OMM (outer mitochondrial membrane) with its kinase domain facing the cytosol, providing a possible explanation for the observed physical interaction with the cytosolic E3 ubiquitin ligase Parkin. Defective PINK1 may cause alterations in processing, stability, localization and activity as well as binding to substrates/interaction-partners which ultimately leads to differential effects on mitochondrial function and morphology. Mutations in PINK1 are linked to autosomal recessive early onset Parkinson's disease, and are associated with loss of protective function, mitochondrial dysfunction, aggregation of alpha-synuclein, as well as proteasome dysfunction. Western Blot analysis of Rat Brain showing detection of ~50 kDa PINK1 protein using Mouse Anti-PINK1 Monoclonal Antibody, Clone S4-15. Lane 1: Molecular Weight Ladder. Lane 2: Rat Brain. Load: 15 ug. Block: 2% BSA and 2% Skim Milk in 1X TBST. 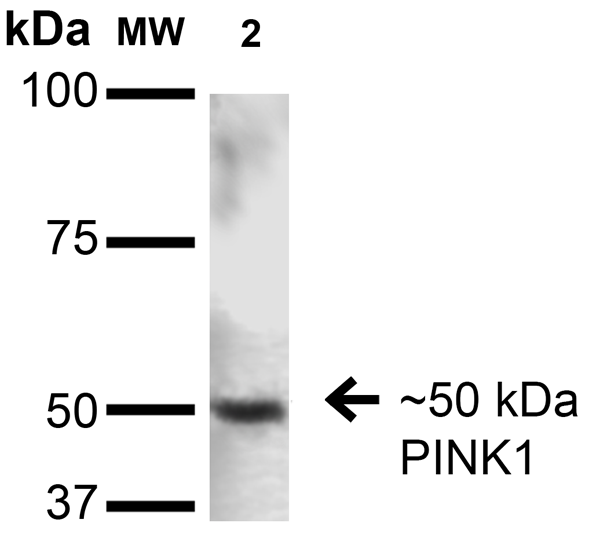 Primary Antibody: Mouse Anti-PINK1 Monoclonal Antibody at 1:200 for 16 hours at 4 degree C. Secondary Antibody: Goat Anti-Mouse IgG: HRP at 1:1000 for 1 hour RT. Color Development: ECL solution for 6 min in RT. Predicted/Observed Size: ~50 kDa. NCBI/Uniprot data below describe general gene information for PINK1. It may not necessarily be applicable to this product. PINK1: Protects against mitochondrial dysfunction during cellular stress, potentially by phosphorylating mitochondrial proteins. Involved in the clearance of damaged mitochondria via selective autophagy (mitophagy). It is necessary for PARK2 recruitment to dysfunctional mitochondria to initiate their degradation. Interats with PARK2. Highly expressed in heart, skeletal muscle and testis, and at lower levels in brain, placenta, liver, kidney, pancreas, prostate, ovary and small intestine. Present in the embryonic testis from an early stage of development. Belongs to the protein kinase superfamily. Ser/Thr protein kinase family. 2 isoforms of the human protein are produced by alternative splicing.